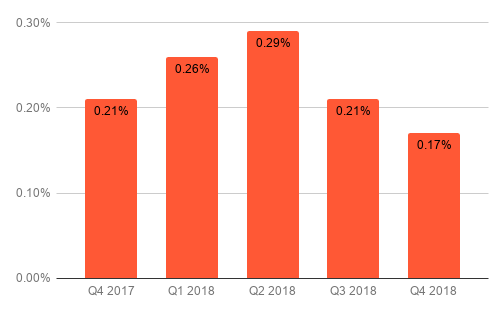 Click-through rates declined for both premium publishers and aggregators in 2018. 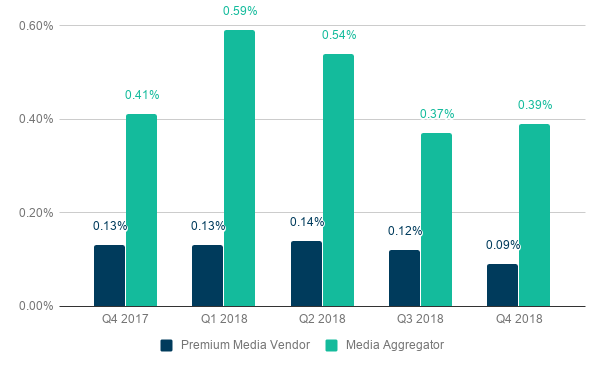 Premium publishers dropped from .13% in Q4 2017 to .09% in Q4 2018. 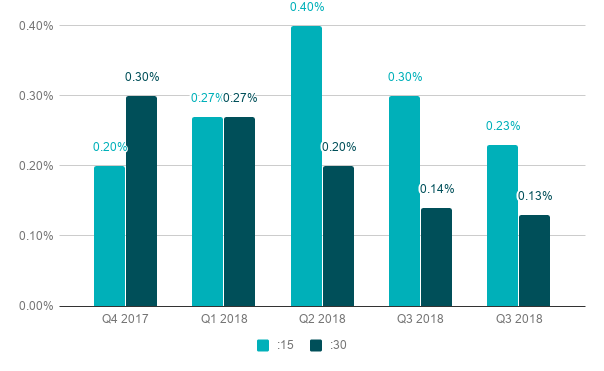 The decrease was less dramatic for aggregators, moving from .41% in Q4 2017 to .39% in Q4 2018. While those numbers represent decreases of -31% and -5%, bear in mind that the numbers here are very small—all less than 1 percentage point. Last year 30-second ads slightly outperformed 15-second ads in click-through rate, but not in 2018. 15-second ads grew by 15% between Q4 2017 (.20%) and Q4 2018 (.23%), while 30-second spots decreased 57% from .30% to .13% for the same time period. Again, a reminder than these are small numbers, all less that 1%. 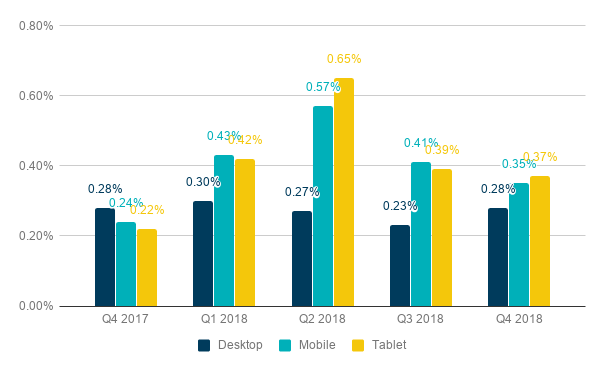 Click-Through Rates on desktop, mobile and tablet remained relatively consistent through 2018 with the exception of Q2, when both mobile and tablets saw a distinct increase. The rates for all devices fell in Q3 and the year ended with the rate for all three back up to levels the same or above Q4 2017. 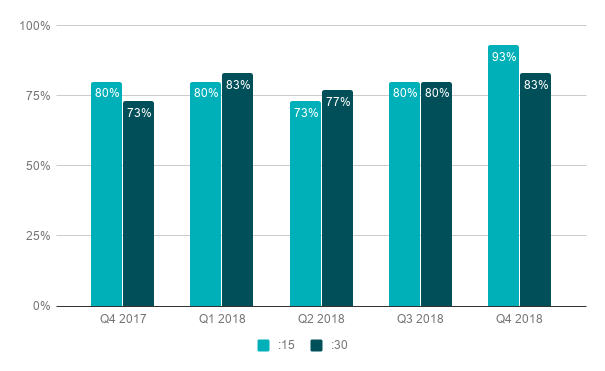 Overall, Click-Through Rates seem to be declining, which we see as an indication that marketers are more focused on viewer engagement, as measured by Viewable Completion Rate, rather than taking an action to click away from the ad. Despite that general trend, the higher Click-Through Rate seen on both mobile and tablets could reflect the fact that online purchases are primarily made on those devices. Viewers, then, would tend to be in a purchasing mind-set and more inclined to click on a product ad when using their phone or tablet than when on their desktop computer. With 30-second ads earning a greater percentage of impressions, time spent with ads also grew—by 35% year over year, increasing from 17 seconds in Q4 2017, to 23 seconds in Q4 2018.